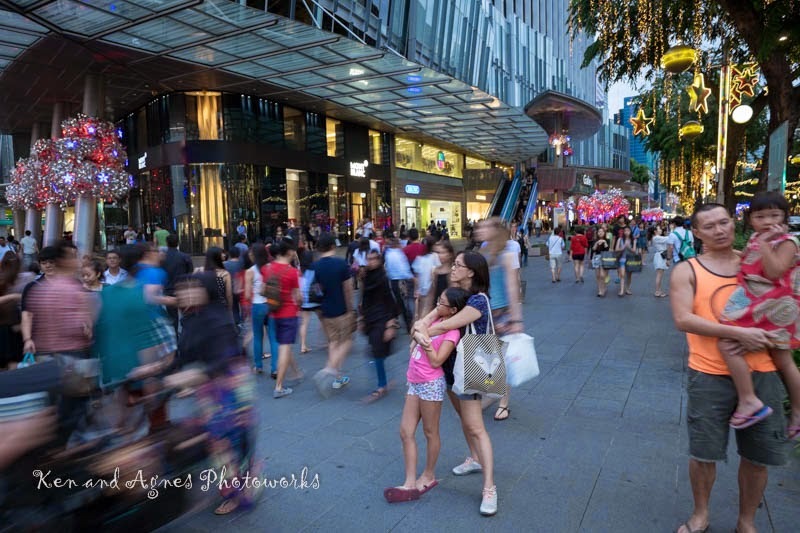 A couple of weeks back, a friend I know from blogsphere passed away due to Dengue. A shock to most of us who knew him, as he was still joking away when he was admitted to the hospital, most of us didn’t take his hospital stay seriously, thinking he would come out in no time. 2 weeks ago, a teacher Zara likes and admires tremendously from school contracted Dengue and was admitted into a hospital with a platelet count of less than 50, we thought we’ll help out as she was from outstation with no family to care for her here. After asking around and googling, we found 2 remedies which will help to increase platelet count. The 1st one Papaya Leave Juice and the other Double Boiled Frogs with Small Bitter Gourd. There’s nothing the doctor can administer for Dengue besides putting the patient on drip and feeding Paracetamol to the patient for fever, hence most people depended on this natural cure. Here is how it’s prepared. 5, 6 papaya leaves from young papaya trees, best if it’s from trees that never borne fruits. Wash, clean and cut the leaves up and then juice them a slow juicer to extract out the juice. Or use a mortar and pestle to pound the leave till a pulp and squeeze out the juice. 5~6 papaya leaves will only extract out half a cup of juice. As the juice is extremely bitter, mix the juice with 1 or 2 tsp of honey. Take 2 tbs of juice 3 times a day. 5. Remove the frogs and bitter gourd, and you’ll get about 1 bowl of soup. 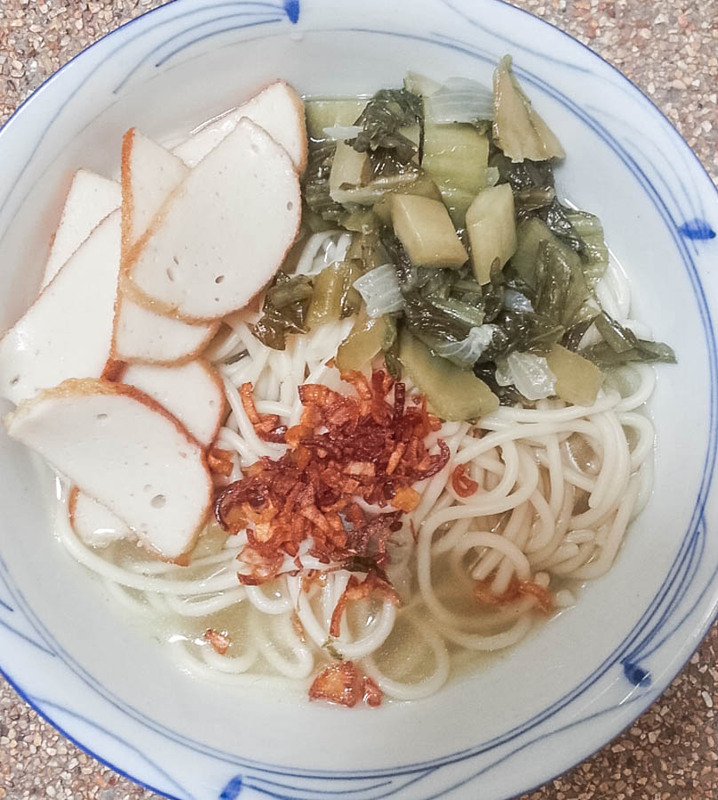 This is another extremely bitter soup, but as the popular Chinese phrase 苦口良药 says, a bitter medicine cures the disease. We made this and sent to Zara’s teacher for the first few days she’s in the hospital, we are glad that her teacher is well after a few days and now fully recovered. If you knew me personally, you’ld know that I love buying books. I was a book worm when I was younger and now still do a lot of reading, although I may not have enough time to read all that I’d bought. I love going to book fest and book sales to find a good bargain, but sometimes I want a specific title which can be difficult to hunt down in our bookshop. For example, I like reading Qiu Xiaolong‘s crime thriller series and it’s not found in our bookshops; My best friend recommended me Half The Sky and I’d been searching for it but only found the Chinese translated version available. And then I was introduced to NoQ Store, a subsidiary of Times Publishing, one of the most reputable names in book printing, publishing, distribution and retail in the Asia Pacific! It’s an online book shop with 14 million titles spanning across different genres and all of them at discounted price! What more? Shipping is free if your purchase is RM50 and above. 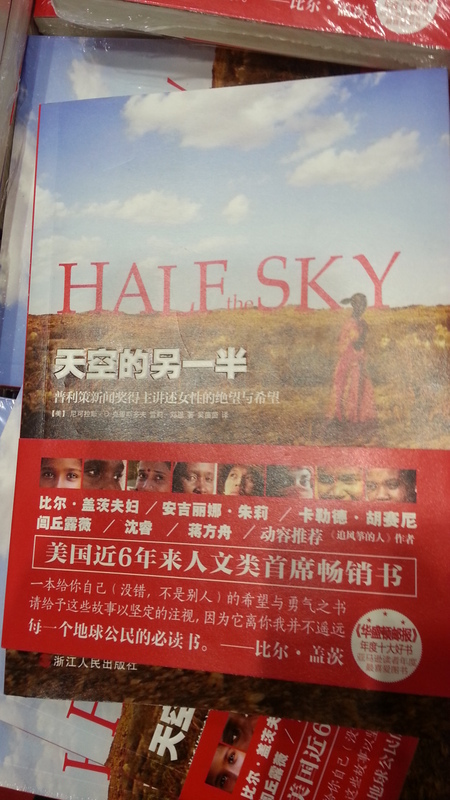 And of course, I found Qiu Xiaolong’s latest books and Half The Sky available there. I’d just ordered them and can’t wait to receive them. If you are a book lover, this is a good place to shop for books. And here is something for you. From 14 August – 31 December 2014, you will be entitled to an exclusive 15% discount on all purchases at NoQ Store. Just use code MYTWOGIRLS at check out. Notice added October – NoQ Store has since been closed from October 2014 onward. 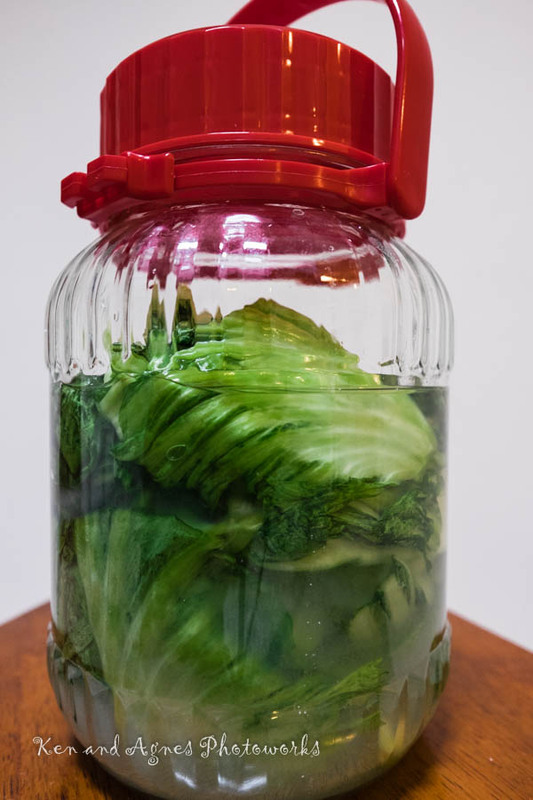 After seeing some videos/posts on how salted/preserved vegetables were made commercially, I’d actually try to limit purchasing of salted or preserved vegetables. So I decided to make my own using a simple recipe I got from Best-ever Cooking Of Malaysia, Singapore, Indonesia & The Philippines. This is the 2nd time I’m making it, the end result is a crunchy salted vegetable with no chemical after taste like those you get from store bought ones. 1. Wash the rice, bring to boil in a large pan with the water. Cover and simmer for 12 minutes. Drain the rice, saving the liquid and letting it cool. The rice itself is not used in this recipe, so you can have the porridge like rice as a meal served with another dishes). 2. 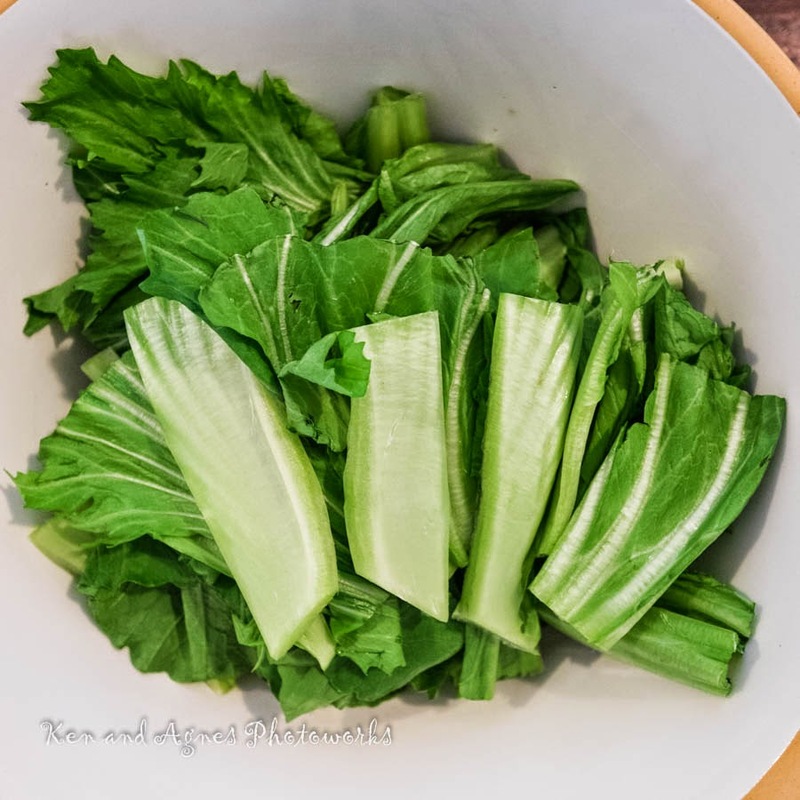 Wash the mustard green in lots of water and dry thoroughly. 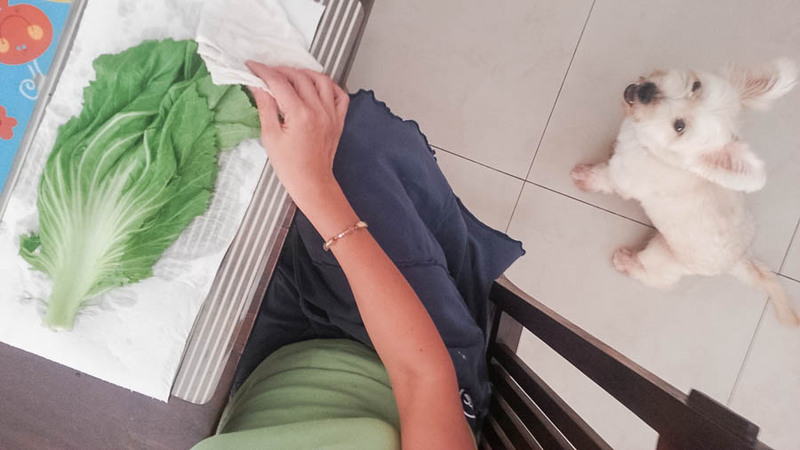 Using a kitchen towel to pat each leave and stalk. It’s important that they are fully dried. 3. 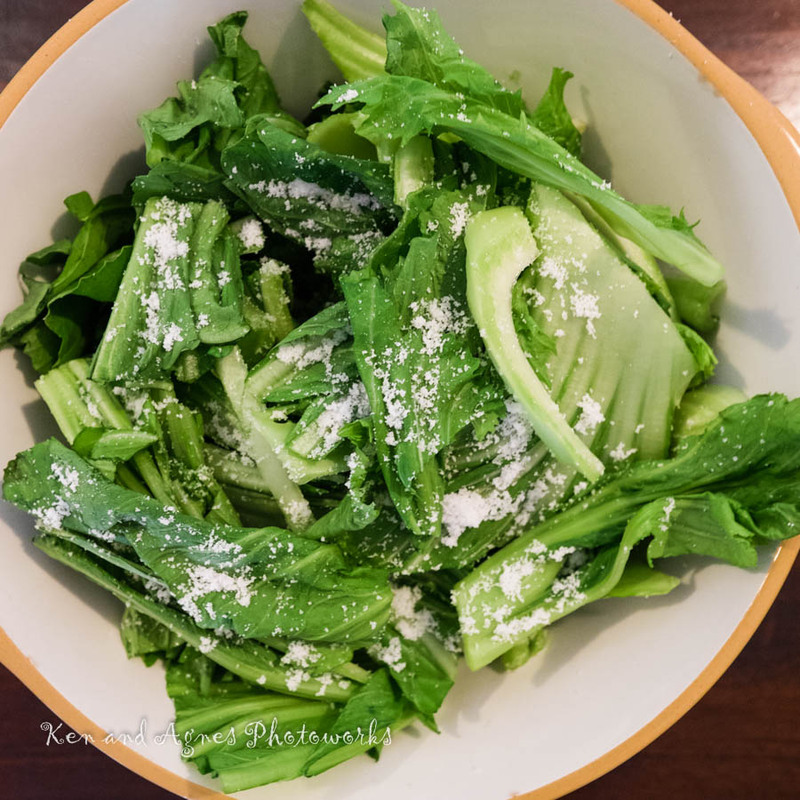 Cut the mustard green into smaller stalks and mix with the salt in a non metallic bowl. Leave it for 30 minutes, then squeeze out as much moisture as possible. Salt will cling to the leaves. 4. 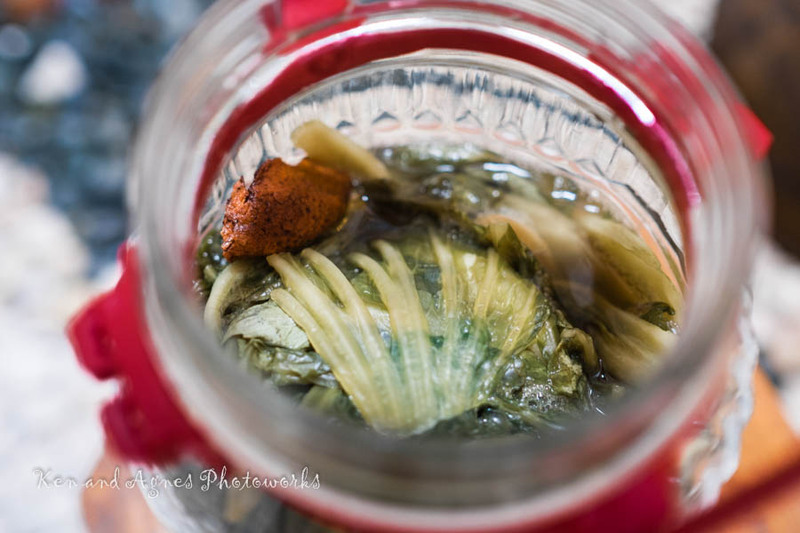 Place mustard green into a jar, and pour over the completely cooled rice water, make sure the rice water submerge the leaves. 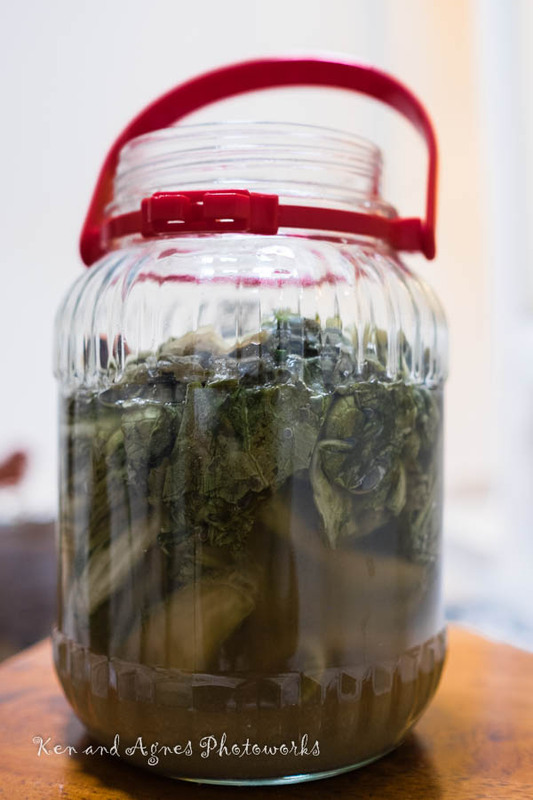 Place the jar in a cool place for 4 to 7 days. 5. Drain the salted vegetable. Use immediately or store it in a container and refrigerate for later use. It can be stored up to a week in the fridge, but will taste better if used immediately. These homemade ones are not so salty, so you do not need to wash them before cooking or serving it straight as a dish. Not too difficult right? The most tedious part of making this is the cleaning of the mustard green (they have lots of sand) and patting them completely dry. Here are some photographs to document the steps. Step 3 – Cut them, sprinkle with salt and let it sit for 30mins. 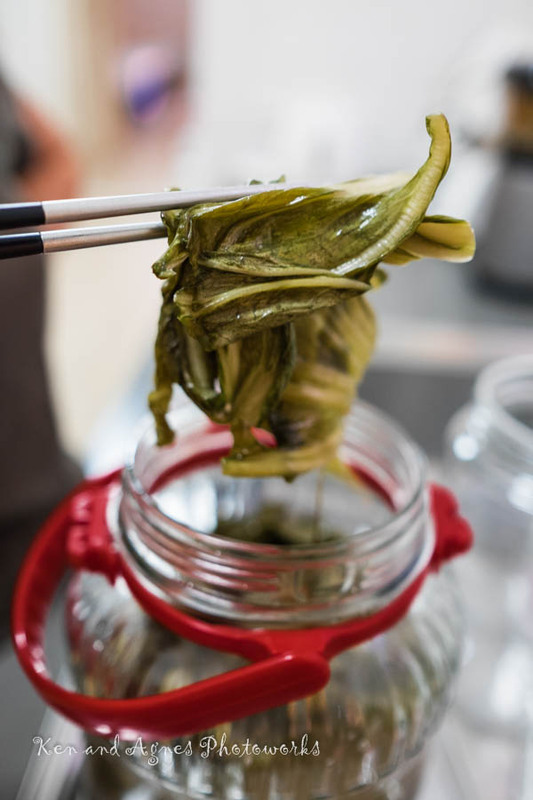 Step 4 – Place them in a jar with the rice water for 4 to 7 days. So how did we eat ours? Cut a few stalks up and add into a bowl of noodle as condiment. Stir friend them with chili, minced chicken with some salt and sugar, and drizzle a bit of soy sauce at the end. I love to eat zong, probably because I love glutinous rice. My early memory of zong was my Ah Ma’s (maternal grandma for Hokkien), with black eyed peas and fatty pork, which is out of this world. I remember she made them all by herself during the Duan Wu (端午节）or the Dragon Boat Festival or as and when someone was visiting my uncles in Taiwan, and she wanted to bring them some. I remember she would prepare the ingredient, put them in small little bowls, then she would sit on a stool, meticulously filling each one up and wrapping them into pyramid perfection. As I spent my first 3 years of primary education living with my Ah Ma, my early childhood memory of food was her cooking. Her simple but delicious kon-loh-mee (干捞面）ladened with deep fried lard cubes and a sprinkle of ajinomoto; and her dried vege pork soup (菜干汤) were some of the best food I’d tasted. Her bak zhang (Hokkien for pork zong zi) was also a legacy, no other zong zi I’d tasted later are up to par. My Ah Ma has passed away many years now due to her grief for the loss of my mum (who lost her fight with cancer). I didn’t learn up her bak zhang’s recipe, as I wasn’t interested in cooking back then, when both the family’s greatest chefs were still around. My loss really. Due to a vow I’d made I’d not been eating pork for almost 20 years now, finding a good tasting pork free zong zi is very difficult, most of them were expensive with not much fillings except for glutinous rice. 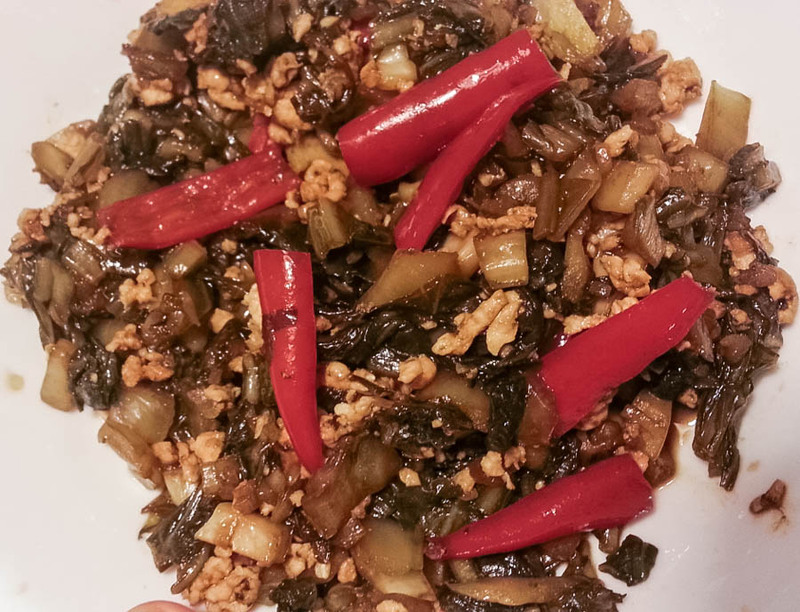 So 4 years ago, I decided to make myself, using good ingredients, replacing pork with scallop following a pork zong zi recipe, and I used split mung beans instead of black eyed peas like my Ah Ma’s. The difficult part in making zong zi is not in preparing the ingredients, but in the wrapping. The 1st year I made them, it took me so long just to wrap them properly and secure them with strings (yes, most of them have to be tied with 2 strings or more! ); and about 1/4 of them burst open during boiling. 2nd year was better, but still took me a long time, and a couple still burst opened. Last year, I watched this recording from Wendy Kong, and that’s when I really learnt how to wrap them properly. With right technique, I spent less time wrapping them, they are better secured and fewer zong zi unwrapped itself during boiling. Last Sunday, while the whole world is celebrating Father’s Day, I decided to use that free day to make some. This is the recipe I used, adapted to our taste over the years. 1. Heat up oil in wok, stir-fry garlic, shallot and star anise until fragrant. Add in oyster sauce and stir until fragrant. Add in drained glutinous rice and stir well. 2. Add five spice powder, stir fry until fragrant. Lastly add in soy sauce, sugar and salt, stir evenly. Set aside. 1. Wrap and tie Zong Zi following this recording, fill the cone with a layer of glutinous rice. Add other filings, top with split mung beans and cover with another layer of glutinous rice. 2. Base a big pot few bamboo leaves (I used the torn ones), add in 2 tsp of sea salt and water (3 cm from the dumpling surface after they’re placed in), bring to boil over high heat. 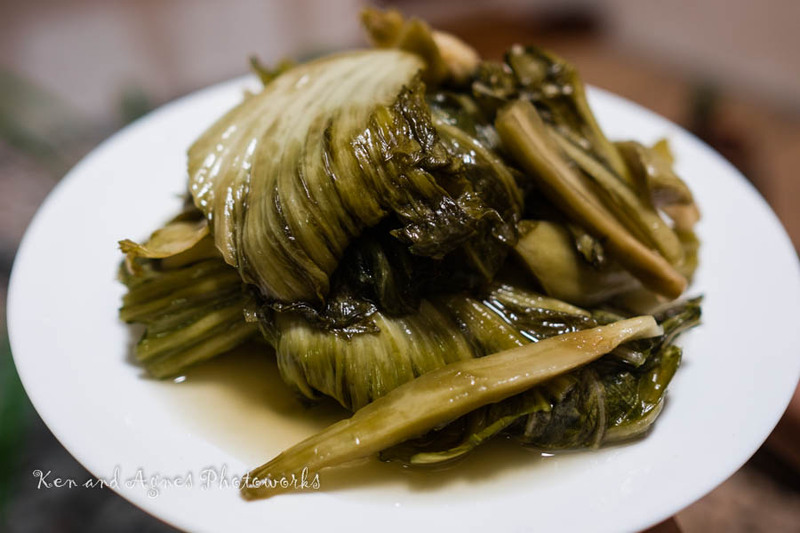 Add zong zi, bring to boil again. Switch to medium heat, continue boiling for 2hrs. 3. Remove one to check if the rice has been thoroughly cooked at the end of 2hrs, if not cooked, continue boiling for another 15, 30mins (adjust your time accordingly based on your observation of the 1st zong zi). 4. 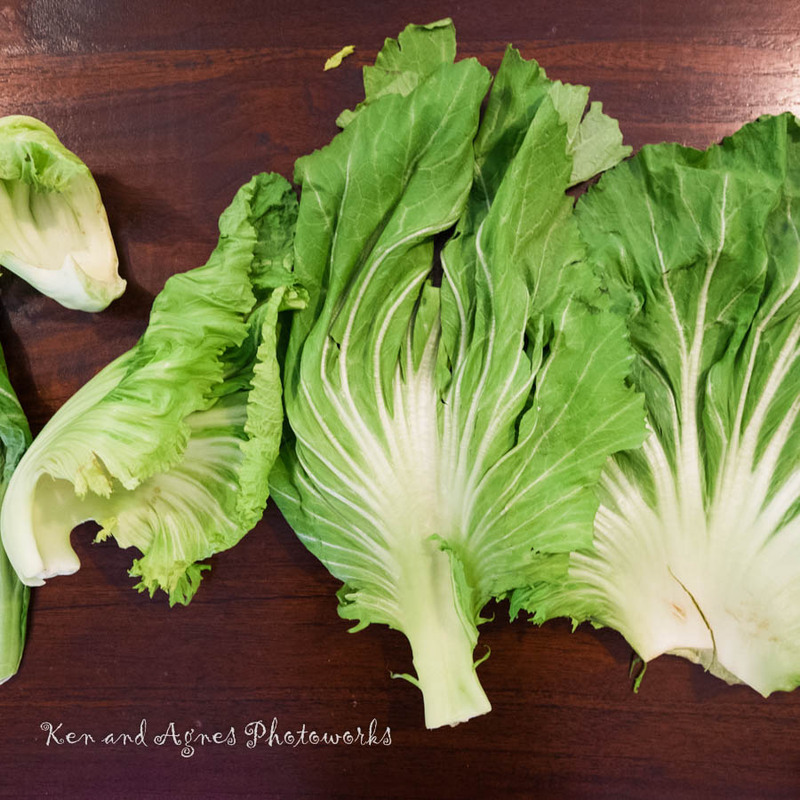 Hang the zong zi in a well ventilated place in order to allow the water to evaporate. In photograph, these are what we used. Wrapping them take some skills and will improve with practice. Boiling them take some time. Hang to let the water to evaporate. Viola, home made zong zi adjusted to our taste. 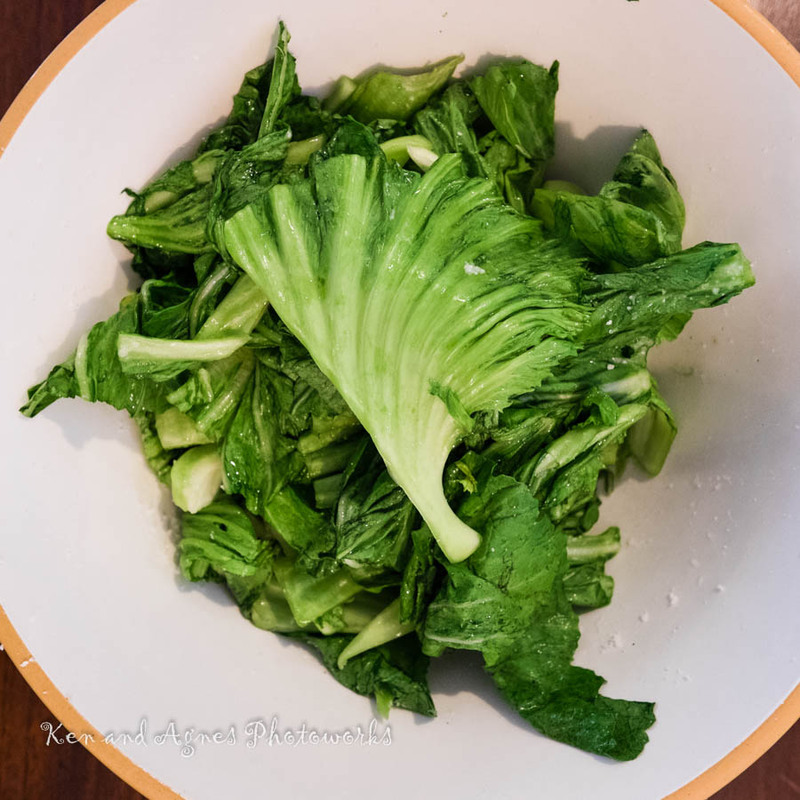 Duan Wu is almost 2 weeks ago, this recipe came a little late for this year, but who said you can only eat zong zi during Duan Wu? As long as you can find the leaves, this can be made any time of the year and adjusted to your own preference. I’d made some according to the girls’ liking as well. Zara didn’t want the salted egg yolk, so I made a few without yolk for her, and double the amount of mushroom. Zaria didn’t want anything except a slice of mushroom. Zaria asked as well, “Why do you make the dumpling using the same ingredients every year? Why can’t you change? Like putting sausages or bacon (what she likes), and instead of green beans, why not put baked beans?” Maybe I’ll accommodate her next time (but not baked beans zong zi though, that’s just too YUCKS).